Earlier today, I tweeted that “voting by mail is a huge privacy and security risk, and states should be discouraging it a lot more.” This generated a number of confused responses, so I thought I’d elaborate a bit. When thinking about security issues, it’s important to understand what your “threat model” is. If you’re trying to secure your company against fraudulent behavior by customers, you’ll take very different steps than if you’re worried about an unscrupulous employee. There are (at least) two basic threats to a voting system. One is that people will be allowed to vote when they’re not entitled to. This might be because they’re non-citizens, convicted felons, residents of another jurisdiction, have already voted, etc. Another threat is that a voter will be enticed or coerced into casting a vote that’s different from his or her true preference. These are different problems, both conceptually and practically. We use a variety of methods for protecting against the former threat, including voter registration, checking IDs or proof of registration, recording the reported names and addresses of people who vote, and so forth. The primary defense against the latter is the secret ballot: since no one knows how you voted, no one can coerce you into voting in a particular way. The former threat has gotten all the attention because Republicans in recent years have worked hard to portray it as a growing problem. (Claims my colleague Jim Harper has greeted with skepticism) They’ve pushed for rules that (among other things) require a photo ID to vote. The debate is intensely partisan because everyone understands that the people most likely to be disenfranchised by such legislation (or in the Republican version the ones most likely to commit voter fraud) are likely to vote for Democrats. Anyway, that’s not what I was talking about. To the contrary, vote-by-mail is probably more resistant to voter fraud than some traditional voting schemes because they create a fairly extensive paper trail. Rather, my point was about the effect of vote-by-mail schemes on voter secrecy. Imagine if an employer, who everyone knew to be a Republican, required his employees to request absentee ballots and show them to him before they were submitted. Think of an abusive husband who insists that he and his wife fill out their ballots together. Or imagine a political operative going around a low-income neighborhood paying people $50 if they let him fill out their ballots for them. This kind of corruption is very hard for voting officials to detect. And more insidious, voters themselves may not even realize that it’s unethical. Now, there are some circumstances, such as soldiers stationed overseas, where absentee voting is unavoidable. But traditionally, to get an absentee ballot you had to give a specific reason that you would be unable to make it to your regular polling place on election day. But in the last couple of decades a growing number of states are dropping these restrictions, allowing anyone to vote by mail without giving a reason. And the states of Washington and Oregon are moving towards mail-in voting as the default option. Although this is moderately more convenient for voters (and election officials! ), the effective abandonment of the secret ballot is too high a price to pay. As I tweeted in response, this is actually a “dirty little secret” of the technical e-voting community in that we have little love for vote-by-mail as it’s horribly inferior to forms of supervised voting (where a trained individual (pollworker) is present and enforcing certain policies… such as only one person in a voting booth, etc.). I think we’ve been reluctant to push on this just because election officials *love* vote-by-mail (and, I mean, *a lot*). Anyway, we should and must engage with it, because it’s being used as the comparison point for more insidious things like internet voting (unsupervised voting on uncontrolled platforms over the public internet) and fax and email voting. No numbers to back this up, obviously, but my gut says that your scary examples are edge cases dwarfed by the gains we get by allowing people to vote using a more convenient method. Don’t throw the baby out with the bathwater. Voting by mail certainly entails security risks, but are these risks so substantial that state governments should discourage the practice? Perhaps, but how can we answer this question without first investigating the frequency with which ballots sent in the mail are actually compromised? Given the harsh penalties associated with mail and voter fraud, my hunch is that absentee ballots are rarely compromised in practice. But, of course, I could very well be wrong in making this assumption. And, as you note, many instances of misconduct (i.e. employers demanding to view their employees’ absentee ballots) likely go unreported. Still, it seems highly unlikely that rampant acts of voter fraud could occur in the United States without quite a few instances of it making into the press or being reported to authorities. It’s also important to note that a major reason voting by mail is popular is because it’s convenient. People rightly tend to place a great deal of value on their time — traveling to a voting booth and waiting in line can be quite time-consuming. (When I voted in the 2008 national election in Arlington, Virginia, I spent almost half an hour waiting in line.) Voting by mail enables many productive U.S. citizens to spend more time doing their jobs and thus, in many cases, creating wealth. Before government discourages voting by mail, it should first consider the positive and negative effects of the practice by weighing the magnitude and probability of voter fraud against the economic benefits of voting by mail. Interesting stuff, I’d never even thought about this aspect of absentee voting before. Anybody know of any good ways to engineer around this and maintain ballot secrecy while still providing the access and convenience of mail-in voting? Joe mentioned “e-voting”, but it seems to me that a pernicious influence would have no more trouble looking at a computer screen than a piece of paper (especially with scenarios like the abusive husband). Again, I know nothing about this, but it’s an interesting logistical conundrum. The real tradeoff here is not one of security for convenience, but rather a modicum of safety for an infinitely more accurate result. If I recall, one of the primary motivators in states switching to a vote-by-mail system was that it would be much easier to see who you voted for, and to have voted for the correct person. It’s a little bubble next to the name, which is far more simpler to a) figure out, and b) provides incontrovertible proof of your vote. Now, this may also have been a response to electronic voting systems, but I still maintain that there is no ballot more accurate than one with a bubble filled in for someone. @Graham: I’ve voted using a couple different systems — here in NC, you actually fill out a paper ballot at the polling place very similar to a mail-in ballot — and it’s never been even a little bit hard to understand who I was voting for. I never understood that complaint. Assuming basic literacy, I can’t see where the confusion would come from. Oregon isn’t “moving toward” mail-in voting. Oregon has mail-in voting. When I see reports of poorer neighborhoods deprived of sufficient voting machines, of long lines, of no paper trail, I can’t help but wonder why voters in other states tolerate it. In any case, Oregon’s vote-by-mail is better than Washington’s; our ballots must be in the hands of the election board by 8:00 p.m. election day. There is no wait as ballots trickle in. Our election results are reported just as those in any other part of the country. Here in Oregon, reports of employer based vote coercion have been few & far between and anyone reporting such activity would have very strong whistle blower’s protections to back them up. As for private, household-based coercion, there is a provision that allows individuals to request that their ballot be held at the county clerk’s office, where they can fill it out & turn in their ballot in private & on-site…. Not perfect by any means, but I am well on the side convenience in the convenience vs. privacy argument as the increase in turnout in local and off-year elections is unmistakable and highly worthwhile. If voter convenience is the primary driver for looking at VBM, let’s move election day to Saturday or, if it stays on Tuesday, make that day a holiday. I don’t think we should discount the value of a shared, public community activity like gathering at the polling place with our neighbors to elect our public officials. If all voting is done at home, would we be negatively affecting the inculcation of voting as a civic duty in the populace (something already on the wane based on voter turnout)? Many time honored practices would be lost if states were to adopt mail-in only systems. Jobs that shave off undesirable votes and increase good votes. As Meg Whitman wants to save EVERY job, so should we. Voter fraud is a time honored tradition. Let’s not throw out the baby with the bathwater. Vote by mail has been the default option in Oregon since 1998. The fears that you refer to are laughable. I’ve never heard of a single issue that you claim to fear, actually happening here. Vote by mail is one of the smartest things I’ve ever come across, and is nearly universally loved here in the state. We get a higher voter turn out as well. Of course that turn out tends to skew democratic. Perhaps that’s your real fear? Tim, you cite some examples of what could go wrong with a vote-by-mail system, but no evidence that those problems exist in any significant way. Any voting system, whether it’s mail-in, Diebold machines, paper ballots, etc., is susceptible to its own set of issues. The question is whether those problems are prevalent enough, on the margin, to represent a real threat to the security, privacy and integrity of the voting process. For mail-in voting, I don’t see that that’s the case, although I would certainly change my mind if I saw enough evidence of voter intimidation for a mail-in system. Oregon has had an exclusively mail-in system for many years, and so far, we haven’t seen such problems. We have, however, seen a 10% increase in turnout, and in the 2004 election Oregon’s turnout was third-highest in the country. To mitigate mail-in voting risks, set up the same provisions you would to protect in-person voting – an anonymous whistleblower line for people to report threats and such. Pass stricter laws against voter intimidation or vote tampering. But don’t discount the real benefits offered by mail-in voting: convenience; not having to take off work to rush across town to my polling place (no small feat for hourly wage workers, mind you); the ability to complete my ballot on my schedule and at my leisure, rather than being rushed in a voting booth; not being swayed last-minute by activists and signs on the way to the polling booth; etc. In the aggregate, abusive spouses are as likely to vote one way as the other, so that risk isn’t too likely to have much impact on the election. The widespread forms of vote manipulation — buying votes and being able to check that the sale went through, employers coercing workers — are difficult secrets to keep. I suppose most of these cases could be handled by allowing voters to cast multiple ballots, with the one that is postmarked last being the one that counts. The fact you don’t know Oregon has been voting via mail only for years now shows a lack of familiarity with the subject. You don’t bother to give any past examples of voter fraud or intimidation that have transpired at work places or “operatives” colluding in some grand vote buying scheme. These are all regurgitated Republican talking points, vote by mail increases turn out which in turn helps Dems. I agree with the critics of your “blah..g” Having lived in Oregon my entire life (29 years), I have no memory of having to wait in line to cast a ballot, nor do I care to make one. Your fears are entirely unfounded sir. As others have said, employer coercion is practically impossible to keep a secret and I’m sure there are some reporters with the Oregonian who would have a field day with the subject. The only legitimate worry that you have expressed is the theft of ballots themselves from the mailbox and then sent in by someone else. But let’s think about that: Let’s say someone stole my ballot. And all of my neighbor’s ballots. As election day nears I might wonder why my ballot hasn’t arrived yet. Then I ask my neighbors. When they say they haven’t received their’s yet either, then maybe I relax a little. But then someone at work (thank God I don’t have to work with my neighbors too!) says something about having gotten their ballot. Now I’m confused and so I call up the election officials. They confirm that the ballots should have been received and an investigation starts. See where this goes? Fraud is reported, actions are taken, case dismissed. At least I don’t have to give up my precious lunch break. And to the one who wants to make it a national holiday? Private employers are not required to offer holidays off. When was the last time you had Columbus day off? Most Americans don’t get that holiday outside of government and banks. You would only be punishing those whose employers do not allow for holidays and do not pay for them. The problem with mail in or any type of early voting is that Democrats seem to be doing it in really high numbers. This is clearly a problem. There was a story in the Huff Post that contrary to popular belief that Democrats have no enthusiasm, they are in fact voting. So of course the author of this article who has worked at various libertarian think tanks would have a problem with this. I’m guessing all these people who think I’m a partisan Republican aren’t regular readers. On a practical level, vote-by-mail in Washington means that our household votes in every election: every special election, every off-cycle election, every initiative, every primary, every school tax levy. My husband’s long commute and rigid schedule, and my near-constant business travel didn’t allow that in the past. We’d have to remember to get absentee ballots or make special arrangements to vote in person. As soon as Permanent Absentee was an option in our County, we were at the front of the line to sign up. Yes, my husband and I fill out our ballots together at our dining table, but for us, that’s a benefit. When we encounter an unfamiliar race, we don’t have to abstain or guess. We can look up the candidates on the Web and learn everything we need to know, then talk things over. The access to information and the discussions help us make better choices. We don’t always vote the same way. The paper trail and whistleblower hotlines mitigate employer review and church voting parties. It would be hard for an employer or a church to get away with such a plan indefinitely. I’m certain there are a few spouses who feel coerced into voting in front of their partners, and who may have made different choices in a private voting booth. Before making every voter pay to prevent this scenario, we need to know how prevalent it is and how likely it is to skew election results. And the opposite is also true – it could be that denying an abused woman the right to vote her conscience may be the thing that helps her recognize that she needs more help than just a private voting booth. I would add the only major threat that voters have ever actually faced in the U.S.: the threat that voters who desire to cast a ballot will be prevented from doing so through, for instance, poll taxes, property qualifications, literacy tests, direct intimidation using violence and murder, etc. Seems that since mail-in ballots largely mitigate this threat and allow me the time and leisure to research my ballot and be an informed voter, the benefits outweigh the possible drawbacks. How would we go about detecting these problems? Would we see divergence of polls with final results? Or are these for small races than may not have comprehensive polling? I’ve lived in OR and WA all my life. Honestly, the thought of traveling and standing in line to vote sounds ridiculous. As @Katherine more coherently points out, I can’t imagine deciding any of these votes without my computer handy to read everything I would like. I am also able to talk with others in my own home about the decisions they’ve made, and they can ask me mine. In addition, I’m able to vote in every single election because it simply arrives on my doorstep. I think that detecting these problems is next to impossible. That’s why the cost of abandoning the secret ballot truly is too high of a price to pay. My favorite example of a situation where coercion could occur is in the case of the abusive husband. I would add that this could easily happen in almost any relationship where multiple people have the ability to vote collaboratively. Imagine an 18 year old kid who can finally vote for the first time and still lives at home. His parents helpfully offer their assistance with his mail in ballot. He suddenly feels extra pressure to vote the way he knows his parents would prefer. Imagine a caretaker who helps an elderly person in the home. The elderly person is no longer able to vote by herself, but the caretaker thinks, “I know who/what she would vote for, anyway”. The helpful caretaker votes for the elderly person. The fact of the matter is that this does introduce a security risk. Simply arguing that we have no metric to prove that it is in fact a major problem doesn’t mean that we should just ignore it and/or open the hole up even wider. Rather, my point was about the effect of vote-by-mail schemes on voter secrecy. Imagine if an employer, who everyone knew to be a Republican, required his employees to request absentee ballots and show them to him before they were submitted. Think of an abusive husband who insists that he and his wife fill out their ballots together. Or imagine a political operative going around a low-income neighborhood paying people $50 if they let him fill out their ballots for them. This kind of corruption is very hard for voting officials to detect. And more insidious, voters themselves may not even realize that it’s unethical. Everything you list here would be a crime and in most cases would be caught. Why not just be honest here – you oppose it because more poor and middle class people will vote which is bad for Republicans. In the 1990s, I encountered cases of both of your classes in Arkansas. Working on a gubernatorial campaign in 1994, we started tracking the addresses of absentee ballots, and encountered a number of these where the voter’s address was a vacant lot, but the ballot had been picked up in person. We also encountered a situation where individuals wearing buttons for the incumbent (later convicted of fraud in an unrelated matter) were going to a senior citizen’s apartment complex and offering to “help” them fill out absentee ballots. We caught this because the janitor at campaign HQ lived there and called them on it. A surprising number of absentees were requested from skilled nursing facilities (a well-known LTC firm was a major player in state politics) with an unusually high return rate. The town I lived in was home to a significant program for developmentally disabled adults, including several group homes. Typically, these people were bussed in to vote. Poll-watching in 1994, I observed a number of these residents collect a paper ballot, go to a voting booth, and stand their until the driver came by and filled it out. When one did this himself and went to hand it to the judge for scanning, the driver snatched it and told him “you forgot to vote for this one.” I challenged these ballots, and for the rest of the day the residents were careful to specifically ask for help from the driver in filling out the ballots, which was technically legal. Motor voter was implemented by 1996, and these voters essentially all disappeared from the polling sites. Checking names and addresses of those requesting absentee ballots revealed that essentially all of them were now voting absentee, which was not subject to scrutiny by pollwatchers. The organization was founded by a former State Senator who had been a kingmaker in Democratic politics dating almost to the Faubus period (he had a disabled son), and had close ties to his machine. The group provided about 150-200 votes in a legislative district that in 1998 returned about 5,000 ballots, and was potentially enough to turn any reasonably close election. This isn’t to say that fraud was actually occurring, but there was certainly reason to smell smoke. Ironically, the “australian” secret ballot was originally adopted in the South as part of the Jim Crow laws in order to identify and control votes. In Arkansas, at least, these laws were adopted as a response to a growing alliance between poor white and black voters as part of the Grange movement in the 1880s, an alliance that threatened to cost the Klan/Democrat alliance political control of the state. Unlike pre-printed party ballots, illiterate voters had to request help from (by law) poll workers to fill out their “secret” ballot, and they had little way to tell if they were actually completed, not counting the intimidation factor of having to tell operatives appointed by the local Democrat machine exactly how you wanted to vote. Prior to the new ballots, the post-Reconstruction state maintained a functioning multiracial, two party system. After passage, voter turnout plummeted, and the Republican voter shares fell even more than turnout would indicate. The issue of properly qualified voters is real. It isn’t a coincidence that Sanchez defeated a long-time GOP incumbent for the Orange County congressional seat only after the Clinton administration cut corners on granting citizenship to a lot of aliens in California. The last Senate race in Minnesota may well have been decided by illegally voting prison inmates. Equally important are checks that voter lists are accurate and individuals are not registered in multiple jurisdictions (which would be a huge problem with college students if they typically voted – at least one conviction for this was obtained after the 2008 election). I signed up to the rss feed.Thank you for your post. I live in Florida, and this is the first year we recieved ballots in the mail box. Now I’m worrying over of all the ways that this could be used to perpetrate fraud. Assuming we would vote in person, I shredded all the ballots sent to our household as I went through the mail, but didn’t think to count and see if I’d gotten one for everyone — this is new for us. What’s to keep someone from stealing a ballot from my box and returning it for me. I’ve received a number of phone calls from politicians to see if family members have sent in their ballots. What’s to keep political workers from stealing ballots and sending them in, or of “helping” groups of disabled citizens to fill out and mail in their ballots, or of buying up ballots in crime-ridden neighborhoods, where people are unlikely to report anything to authorities. The fact that vote by mail tends to favor one party over another also makes it suspect, especially in light of some of the sneaky tactics used in the last election — ACORN, busloads of voters brought in from outside for local vote-by-a show-of-hands primaries. The more I think about it, the more anxious I feel. I want to know specifically what’s being done to make the vote by mail process secure. The vague defense that Oregon hasn’t uncovered many instances of true fraud, doesn’t make me feel very safe, especially here in Florida, where Alan Greyson is the king of aggressive, dirty, deceptive politics. I’m sorry, but in this age of unprecedented identity theft, where you feel you need to shred every piece of mail you throw in the trash, vote-by-mail seems way too vulnerable a process for something so critical to our freedoms. Never though it was a problem until this year. Mail ballot disappeared no one can explain, nor do they care. I guess I know the real answer. Went to the election burean to vote because of my missing ballot. Witnessed an old lady being “helped” to vote, and began to wonder how often that happens. Heck in California people have been know to go to homes of the mentally challenged and “help” them vote. Current system has so many ways to corrupt the process its become the latest political joke. Also learned you can call the registrar office and they’ll tell anyone how your registered just by giving them the street address. Maybe that’s why my vote went missing. I too live in Oregon and believe the vote by mail system needs improvement to insure that fraud does not occur. In its present form fraud can and likely does occur. To say otherwise is naive. For example, my daughter who is married and hasn’t lived in Oregon since 2006 continues to receive ballots mailed to our residence. We recently questioned our local county clerks office and we were told we should have informed them sooner. Really? So just how many ballots does Oregon mail to people that are deceased or have moved away from the state? Just how many people in Oregon vote that shouldn’t have? No one really knows. While I do believe that voting should require a trip to a polling place I will acknowledge that vote by mail is convenient and allows me more time to complete the ballot. Changes need to be made. Our auditor assured us that Mail In Ballots would be faster in the counting process and having the results by “morning”, rather than days later. Quite the “opposite” has occured as a result of machine xcounting foul-ups. At the polls, votes are tabulated right there in the neighborhood precinct by a small machine. No “remakes due to complications of wrong double voting or spilled coffee on ballot, etc. No way to “cheat” with poll voting. Maybe less convenient, but a hundred times more honest results. All of the examples you give could also apply to voting in person. Voting booths are vulnerable to Van Eck phreaking and other hacks. Good old fashioned mail ballots are less susceptible to modern techniques being used to falsify votes and monitor people’s choices. I think all voting should be done in person, at polling both, and only after showing photo ID. I am also concerned with those that are mentally incapable to fill in ballot by themselves. Should they vote?? Would you want a blind person driving a car? Just because someone is of a certain age and citizen shouldn’t give automatic right to vote. Helping to “drive” the country is too important job to leave to those that don’t have a clue as to how their vote effects the country. Some just live a surreal world. They just vote and go back to their fantasy world. Ever watch watch “Water’s World”? I can’t believe I just read a comment bitching because he had to “wait in line a half-hour to vote”. I spent months crawling around the jungle defending that right to vote-I’m terribly sorry you were so inconvenienced! I do worry about election fraud rather than voter fraud but I’m an absentee voter, have been for 30 years with never a doubt. I prefer it as it makes it easier to research the candidates and issues and it beats hell out of standing in line. NC is the best example but there are many others of states with waiting times of 6-14 hours after GOP abuses. I never thought I would encourage straight ticket voting but the Radical Republicans have made it our best defense against the onslaught of Fascism. There has to be some alternative to mail-in ballots for people who cannot make it to the polls. Early voting partially solves this, though it needs at least a few days when it’s open in the evening and maybe a weekend day too. For people who cannot make it to the polls, 2 election officials (one from each of the major parties) can go to the person’s home to give them the ballot and make sure that no one is watching. There can even be provisions to do this at town and city halls other than the voter’s own town. 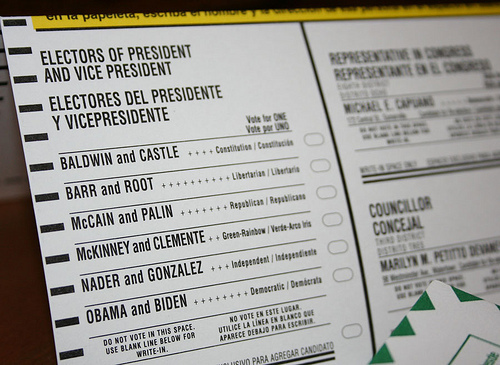 BTW, there also needs to be penalties against people photographing their ballot.